I've been putting off reviewing Civerinos for ages because I feel like I'm going to have nothing more to say than... IF YOU LIKE PIZZA YOU NEED TO GO HERE. But I still needed to get a review up on here as it is one of my go-to places to eat out in Edinburgh. So without further ado, here we go with a review that is essentially an overly extended way of saying I love Civerinos. 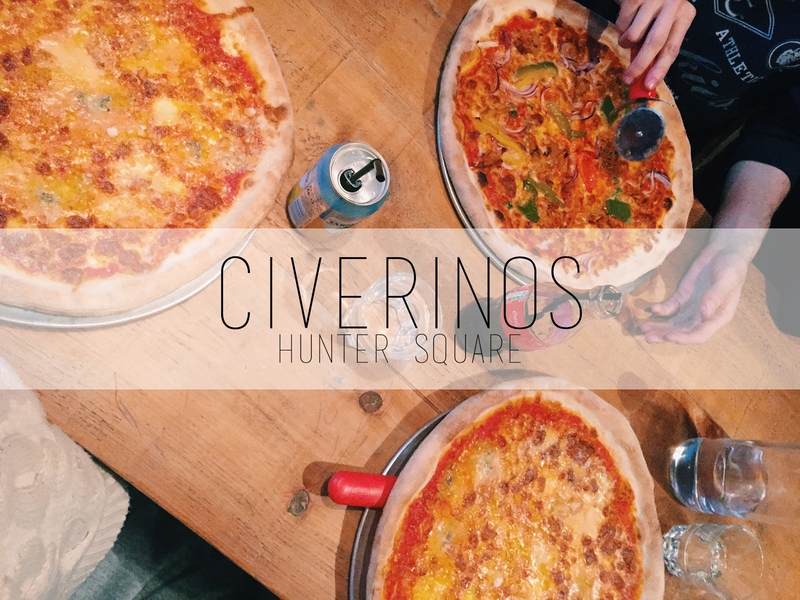 Civerinos is located on Hunter Square just off the Royal Mile and North Bridge, it is fairly small and doesn't take bookings unless your party is of 6 people and over. This can be a bit problematic as they are often quite busy, but guys the food is worth the wait. It is very similar in seating to say Wagas, which might put a few people off but doesn't bother me. They have a series of long benches and you just all basically eat together. Hey, you might make some new friends! 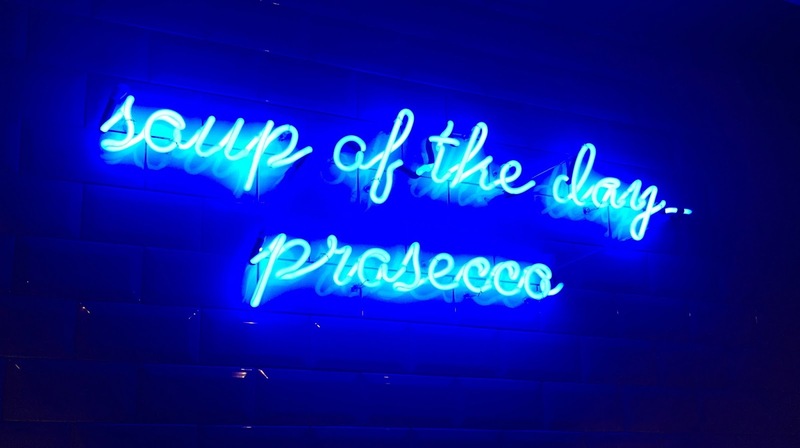 I love the décor in Civerinos, the combination of art and music create a really great ambiance, it's the first place I want to take my friends. I've tried pretty much every starter on the menu and my top favourites include the arancini (you can't go wrong with deep-fried balls of risotto stuffed with mozzarella), the meatballs and the zucchini fritters which surprised me in how good they were. The only starter I'd pass on having again would be the mozzarella croquettes, they weren't cheesy enough for me but I do like things cheesy. I've only recently tried their pasta, since when I go I am usually craving pizza. I had their Traditional Guanciale Carbonara and it was so good, not too creamy that it's sickly, plenty of flavour, and big chunky bits of meat. I was really pleasantly surprised, and my new favourite thing to order is to go half-and-half on a pizza and a pasta (with a friend of course). Of course, the highlights of the menu are the pizzas. Stone-baked sourdough with fresh, delicious sauces from recipes passed down from generation to generation, make these really close to authentic Italian. It's the closest I've come in Edinburgh to the type of pizzas I'm used to growing up in the South of France. While I usually order the Quattro Formaggi (which really has the four cheese balance just right as there's just enough gorgonzola for that kick without it overpowering the milder cheeses), there are a few others I definitely recommend. The Hangover pizza is great, it features Italian sausage, pancette, mushrooms topped with an egg, the Cheese Steak is great with big pieces of rare Scottish flank steak thrown on top and you just can't go wrong with the classic Meatball pizza. I'm really eager to try the Gamberi e Pesto (prawns, pancetta, sun-dried tomatos, ricotta and pesto) and the Potato Bianco which is a white pizza, something I'm usually a big fan of. 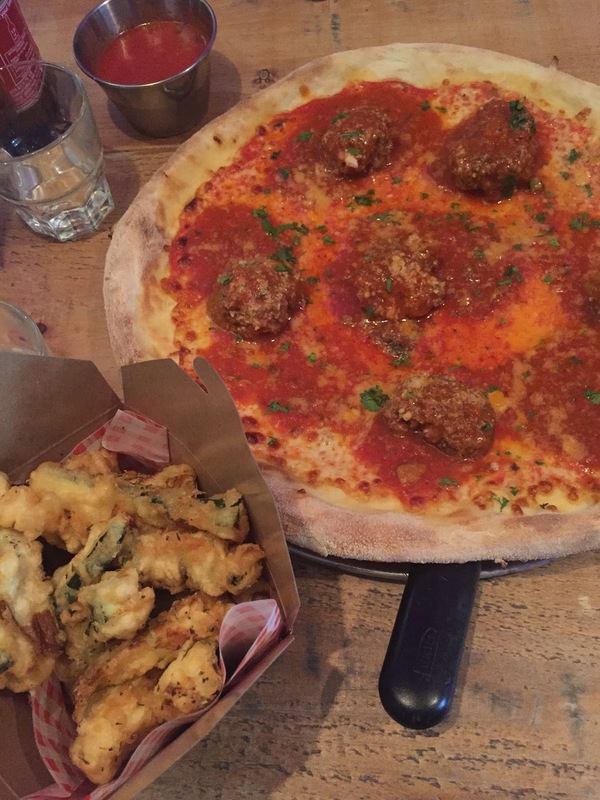 If there's something wrong with you and you don't fancy a pizza or pasta, there's also a selection of italian salads as well as big share boards to pick at with a couple of people while you indulge in a little drink. They have an alcoholic slushy machine with froze on tap, which is a must have if you love a bit of wine. For dessert Civerinos have an absolutely epic Nutella Calzone, which is insanely decadent and not recommended for parties of 2 or less (unless you've got a big appetite). It is essentially a full-sized calzone filled with Nutella. Perfect for sharing with a big party though! My friend and I took it on after half-ing a pizza and still couldn't finish (don't worry we took some home). I haven't tried any of the other desserts, but my friend says their new amaretto ice cream sandwich is great. Here goes my only complaints, I do feel like the menu is a bit small and I think I feel this way because I go here a lot and sometimes I feel like I wanna try something new, then realise there's not much I haven't tried. Plus I have total faith that if Civerinos were to add in a couple new additions to the menu they'd be top quality. My only other complaint is that they won't deliver to my doorstep, but this complaint is going to be pretty short lived as coming soon is Civerinos Home Slice which better deliver to Calton Area or I will riot (just kidding... maybe). Plus from the Home Slice Instagram, it does seem like there's going to be some new additions to the menu which I'm very excited about (will probably still end up ordering a Quatro Formaggi every time though). I'm sorry but not sorry for hyping them up so much, but I can't just pretend the food is average when it's not.